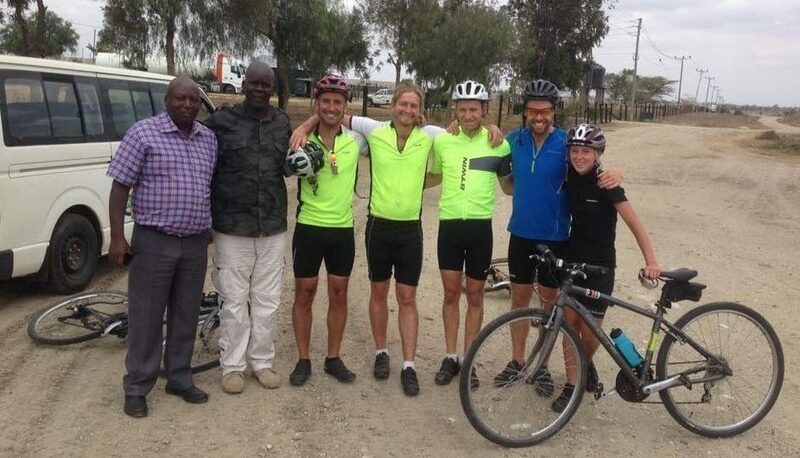 Kajiado was new territory for me – most of my experience and knowledge of Kenya is in the Rift Valley, so the team and I were excited to start day four, knowing that Kajiado was the last major town before the border. The ride was one of the most surreal I’ve been on before; there were so few shops, villages and even people on the whole stretch to the border town of Namanga. The terrain was relatively flat for the first two thirds of the ride but a pretty fierce headwind meant we couldn’t get anywhere close to the speeds we racked up in Nairobi. Instead, we took in the incredible views of the south’s famous rolling hills and the land was becoming drier. Nairobi – awful pollution aside – is a relatively green city due to its relatively cool climate and rainfall but we could feel the temperature rising significantly throughout the morning going south. Vast swathes of green trees and grass were fast disappearing, replaced by dust and plants that need the rainy season to come early. The head winds got worse as the ride wore on but we reached Namanga shortly after lunchtime. The town connects the Kenya and Tanzania border and we stayed in a small guesthouse for our final evening in Kenya. The four days cycling caught up with everyone because we were all in bed by 9pm – knowing that tomorrow is likely to be be the hardest day of the whole bike ride.